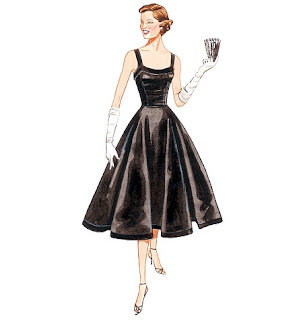 Here's the pattern of the dress that I've been working on and the drawings from the Vintage Vogue Website. I have to say that if you're even thinking about buying patterns from Vogue or Butterick or McCall's now would be a good time to go over to their site and take a look. The three combined companies have one of their super sales going on for Club BMV.com members. This happens fairly often, and I've meant to write about it on here before for those of you who haven't heard about it before. It goes something like this: you buy a Club BMV membership for $15 (that's good for 1 year). And then you get the club discount. Right now if you were to buy two of the club sale patterns you would have already made you money back. I have to admit, I was a little shocked the first time I saw the full price for a Vintage Vogue pattern (or any pattern for that matter). The price on the pattern is listed at $25 (which to me seems more than slightly ridiculous). The regular price on the website is $15. The sale price today is $3.59. It says that the regular sale price is $3.99, but I remember trying to order before I bought the membership last time around and they rang up at full price until I bought the membership, so I'm not sure how that works. I'd try it out without the membership first, to see if it works on your computer (because it seems like it should if I'm reading the prices correctly!) but if you sew a lot and buy a lot of patterns (and love the Vintage Vogue patterns like I do!) it's probably worth it to buy the membership! I haven't bought patterns in a while and don't plan on anytime soon, but the one time I ordered patterns I definitely felt like I got my money's worth! And I can't help but going back to look at all the beautiful patterns that they keep coming up with in the Vintage Vogue section. There is one pattern that is tempting me (I'm resisting!) that I thought some of the crafty head covering ladies out there might be interested in. Vintage Vogue offers two different hat patterns that can be found here and here. I'm not sure how difficult they are, but some of the hats are very cute! Mmmmm.... those patterns are so delicious! 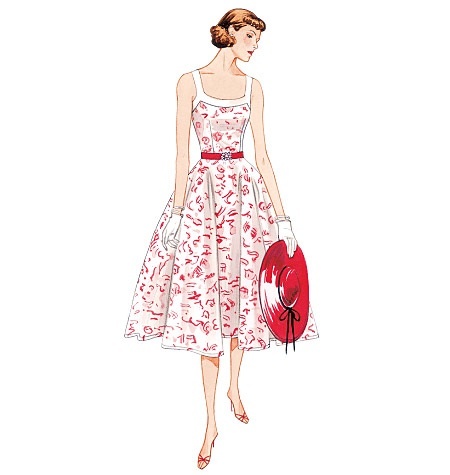 I do have a Vintage Vogue pattern that I've been meaning to make up at some point. Can't wait to see your finished product! Oooh! What a cool pattern!!! I can't wait to see what it will look like when you're finished! It's going to be beautiful!!! !